As the Triple B and Jackson Mountain cases move through Discovery in federal court news stations and advocacy groups put out press releases discussing the beginning of bait trapping at Triple B (also Maverick Medicine, included in the Triple B EA, and Antelope). Yet there is no discussion of the active cases that have been “playing out” in documents effecting Triple B. The Triple B EA, that had public comment period, gave rise to the issues of drought and renewed removals. Currently BLM has little space in holding and districts are literally “wrestling” over what areas will actually make the roundup schedule (to be announced shortly) for the 2013/2014 “roundup year,” that begins in July and runs through February. 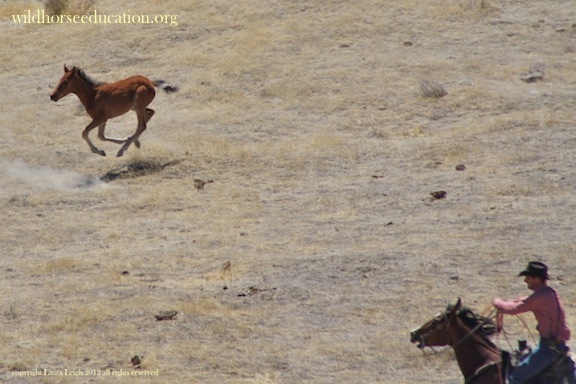 Wild Horse Education has been expecting “drought” to be a buzzword in the contest to make the schedule and has been actively collecting information. 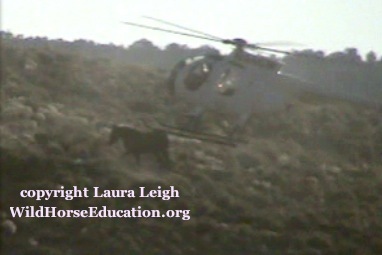 How did we get to this bizarre Record of Decision that has no match anywhere in the BLM wild horse and burro program? Let us recap the “action.” In August on 2011 Laura Leigh filed suit at Triple B. That suit gained the first Temporary Restraining Order to conduct in the history of the program. Next BLM announces the Triple B review in a press release that mentions the court Judge by name, Hon. Howard McKibben, as a reason for the review. BLM brings the documents into court and claims “mootness” as the specific roundup has ended, the court based on precedent allows BLM’s motion. Leigh has another case that went to the Ninth Circuit where she wins against BLMs “mootness” argument on First Amendment claims, new precedent or case law is now created. Leigh petitions the court in the Triple B matter based on the case law created in the Ninth Circuit and is granted a Preliminary Injunction at Triple B. At the same time she amends the Triple B complaint to include conduct at Jackson Mountain where BLM is running foals in July under a purported emergency. The Judge grants her TRO at Jackson Mountain. As the First Amendment claim goes back to the District Court for hearing BLM pulls out the IM (Memorandum) on Access that they created at the same time they created an IM to “humane care” post Triple B Review. Leigh is able to argue that the IM has changed nothing, it gives the exact same parameters that existed prior to it’s creation. Another action at the Owyhee Complex gains a TRO and then actions are only resumed after BLM claims severe financial hardship and the court issues very strong language to expectations of handling (that case is also still active) BLM is defeated on the motion to dismiss Jackson Mountain, the decision also citing the new case law. As Triple B heads through Discovery based on roundup conduct it can be logically expected Leigh will demonstrate the IM on humane care is as worthless as the IM on Access. IF BLM is defeated in their attempts to hide what happens during a roundup in Discovery, and IF BLM does NOT fly choppers at Triple B, could it be possible they will again attempt a mootness argument against Leigh claiming that her case against roundups is no longer valid? BLM is attempting to refrain from giving up any Discovery on operations at both Triple B (that includes Maverick Medicine) claiming that she has no right to ask (both briefs are loaded below). If BLM fails to win the argument in Discovery and has to give up the documents is it possible that Leigh will win her claim? Is it possible that the ONLY bait trap operation of such scale in the entire program will be an attempt to again avoid the issues in court? On Friday arguments of Discovery will be heard by conference call. As soon as a decision is reached we will update. ALSO please keep in mind that WHE expects to continue to follow this area of operation and all that occurs there, including the new developments. Expect news soon of continued actions in this area. The Owyhee hearing for Preliminary Injunction has been rescheduled to begin July 3. BLM has told the court in documents that there is no intention to begin the next phase of the Owyhee Complex operation, 850 horses out of Snowstorm. However as we have seen actions to the contrary in the past, we are moving ahead after Leigh’s surgery. video created before legal action was filed. There are only TWO individuals that have the power to enjoin a federal agency if Congress fails to act… the President and a Federal Judge. BLM is doing all they can to avoid the scrutiny of the court instead of allowing the issues at hand to be heard. That should tell you something. PLEASE take time to read the pages in this website and to follow the court actions. WHE is a small organization devoted to gaining information and taking required action. We spend very little time creating social networks and using limited resource to fundraise. ~Thank you, WHE and all of it’s dedicated volunteers.